Another pretty day. No agenda. We drove south to Orschwihr. Parked and looked about. Walked into the Chateau d'Orschwihr winery. I have had their wine and liked it, so it seemed like a good idea to try some more. The winemaker, Hubert was there to take us through many wines. Perfect English, very gracious, very familiar with new world wines, too. We started with a cremant and moved onto the drys and then the stickies. We came out with 5 wines (we had to stop 'cause we only have 24 slots. 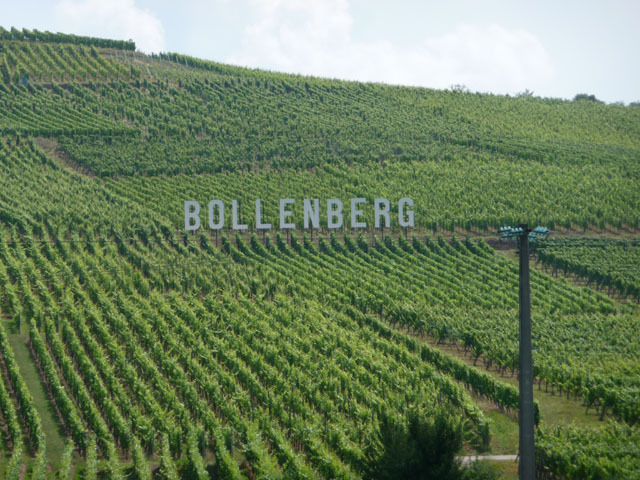 Oh- for some reason, very kind, but Holger brought us 3 bottles of Bordeaux, so we gotta get that home, too. Thanks Holger.) It was time for lunch. We headed south and passed by one of the Grand Cru vineyards (got one at Ch. d'Orschwihr), Bollenberg. 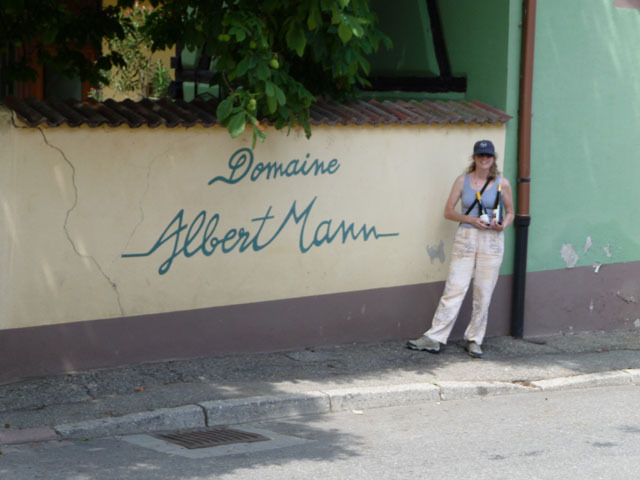 After lunch we walked about the village and went to Domaine Albert Mann. The Times did a review last month. 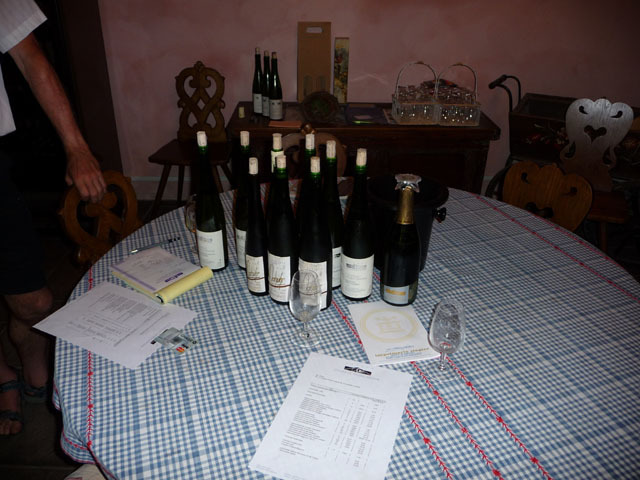 Since we new we were coming to Alsace, I put it on my list. Very helpful guy, who also spoke perfect English, took us through the wines. They do many in screwcap. Yipee. If there was anything we wanted, we were told to contact the only importer, from Pennysylvia, and it shouldn't be a problem to get it. We walked out with 4 (only one screwcap. They export most to Australia/New Zealand), one a pinot noir. Really. Okay, now for the tourist bit. 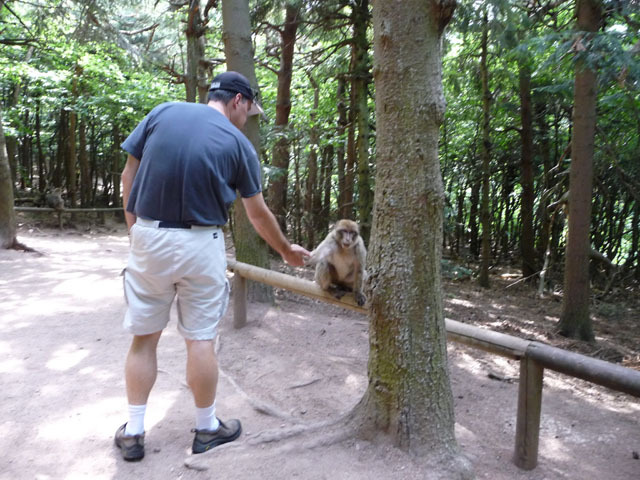 We drove south to Kintzheim to La Montagne des Singes. 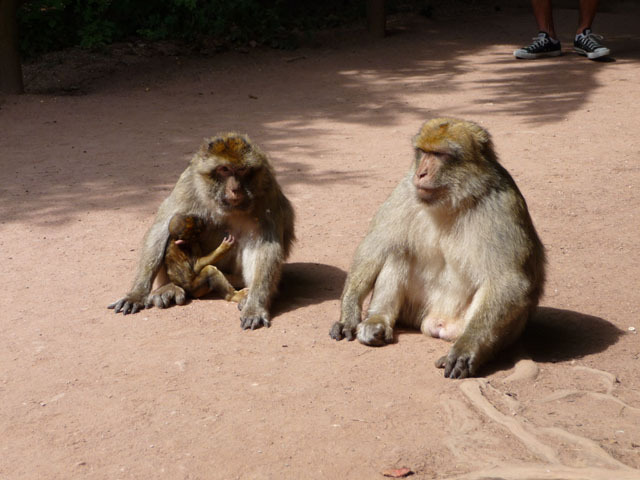 This is a rehab/sanctury for the Barbary Macaque. When you come in, they give you popcorn to feed to the ones that want it. 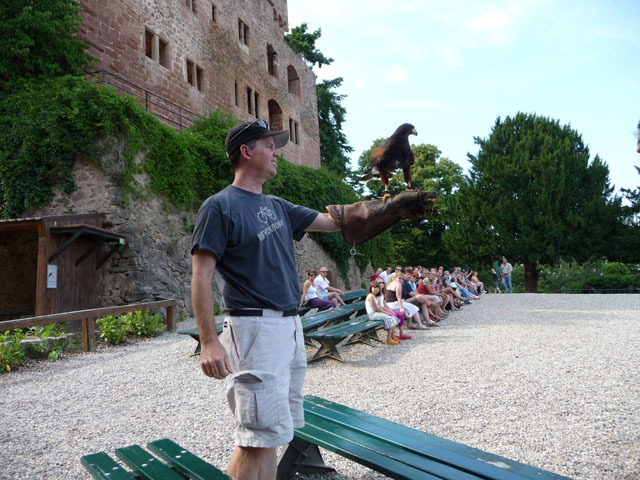 Then we hightailed it to La Volerie des Aigles and caught the last presentation of the Eagles, vultures, other birds of prey. Very pretty seeing the birds flying about the castle. Busy day. 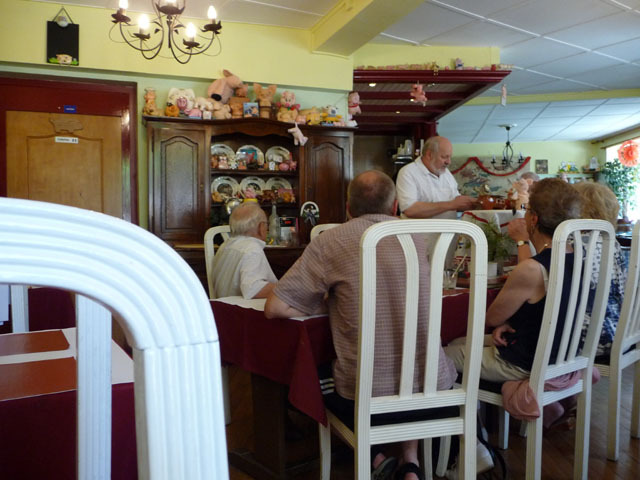 Finished with dinner in Riquewihr at Restaurant La Dime. Got the small plates (no joke that was what was on the menu). Jeff had only 2 sausage with choucroute and a green salad (not a proper choucroute garni, but way enough) and I had the galettes. This was two very big masses of shredded fried potatoes topped with smoke pork product and munster cheese melted on top. Oh a small salad. We shared an 06 pinot blanc VV from Freyburger et Fils. Finished with a cherry tart and coffee. The waitress warned us about the pits in the cherries. It took awhile for me to get it, but I did know that they are left in, so that helped. Not too late tonight, since we got a driving day tomorrow.